Will Eves-LePage controversy make Augusta even more dysfunctional? Gov. 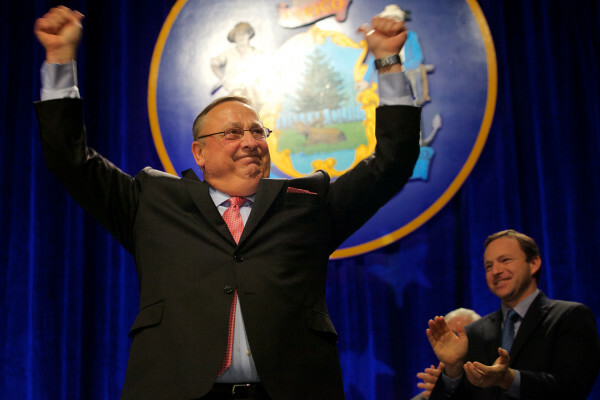 Paul LePage celebrates while taking the stage at his second inaugural in Augusta on Jan. 7. Speaker of the House Mark Eves applauds. AUGUSTA, Maine — With House Speaker Mark Eves fired before he started work as leader of Good Will-Hinckley School after Gov. Paul LePage threatened to pull more than $500,000 in annual state funding to his new employer, the bad blood in Augusta has gotten deeper than the flood stage it was at during recent squabbles over tax and welfare reform. On Thursday, LePage doubled down on his criticism of the nonprofit for hiring Eves, a North Berwick Democrat, who has opposed charter schools during his four terms in the Maine Legislature. Good Will-Hinckley operates a charter school, the Maine Academy of Natural Sciences. “Speaker Eves has been an ardent foe of charter schools for his entire political career, then he turns around and gets hired to run a charter school,” LePage said. “To provide half-a-million dollars in taxpayer funding to a charter school that would be headed by Maine’s most vehement anti-charter-school politician is not only the height of hypocrisy, it is absolutely unacceptable,” he said. Eves said in an interview Thursday that while he has opposed charter schools, his career as a professional counselor attracted him to the more than century-old mission of Good Will-Hinckley, which, in addition to the charter school, operates residential and day programs for at-risk youth. The organization also operates a museum on its Fairfield campus. Eves also reiterated his accusations of blackmail and political retribution by LePage, and said he and his attorney were contemplating legal action against the governor. While the controversy around LePage’s financial threats to the nonprofit has had the most immediate effect on Eves, who is now out of a job, others speculated about the impact it may have on the normal operation of state government. There’s still work to be done in the current legislative session, including final votes on the two-year budget that just barely won enough approval in the House. Now the speaker of the House has accused the state’s chief executive of breaking the law. That’s got to imperil the ongoing legislative session, right? LePage has alienated some allies with a promise to campaign against anyone — including fellow Republicans — who opposed his efforts to eliminate the income tax. The threat was made real when Maine People Before Politics, a political organization allied with the governor, launched robo-calls recorded by his daughter, Lauren LePage, against GOP senators who supported a budget plan that didn’t include tax cuts. The governor has promised to veto every bill lawmakers pass in protest of legislators’ rejection of his efforts to kill the income tax, saying bluntly the move was designed to waste lawmakers’ time. He followed that up with 64 time-consuming line-item budget vetoes, which took the better part of two days for lawmakers to overturn. Last week, the governor put a pox on both houses when he criticized Democratic and Republican leaders alike for the budget they negotiated behind closed doors. That document was a far cry from LePage’s original proposal and contained several initiatives the governor described as pork projects. In other words, dysfunction between the Legislature and the governor had already peaked before Eves was fired. Lawmakers had begrudgingly accepted the extra work of vetoes and the distractions of LePage’s outbursts and, for the most part, had come together in a united effort to finish the session and go home. Eves said in an interview Thursday that he expected the Legislature to continue its work when it reconvenes June 30, despite the controversy surrounding his firing. The first order of business will be a vote on whether to override LePage’s veto of the overall two-year budget. But not everyone shares Eves’ and Timberlake’s assessment that the Legislature will move on unaffected by the row between the speaker and the governor. David Farmer is a columnist for the BDN and political consultant who worked for LePage’s Democratic opponent in last year’s gubernatorial election, and who worked for LePage’s predecessor, Democratic Gov. John Baldacci. He said LePage’s actions will leave lawmakers wondering if they, too, are fair game for retribution. That could have a chilling effect on their decisionmaking while casting votes, he said. “If the Legislature allows itself to be influenced in an extracurricular way by the governor, and allows itself and its members to be punished outside the political arena, using state resources, for actions they take as lawmakers, that undermines the constitutional balance of power between the legislative and executive branches,” he said. Ultimately, regardless of any potential legal action LePage may face at the hands of Eves’ attorney, those are the questions lawmakers will be left to answer as they decide whether to take any action against the governor. Several members of Eves’ caucus are contemplating actions up to and including impeachment, though Eves says he is not involved in any of those conversations and will not be, given the personal stake he has in the fight.